Sometimes I collect things, and sometimes I just buy a collection of things. 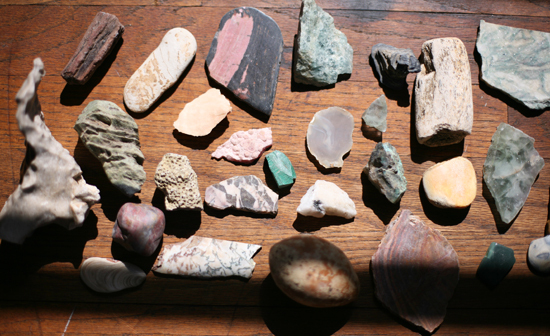 Yesterday, I bought a collection of rocks (see photo above). It wasn't planned and I'm not sure what came over me to make me purchase 50 rocks, but I did. I think part of it might have to do with the fact that I need more than just photos of pretty interiors as inspiration. The Internet has a way of making something so accessible and everywhere that it's not special anymore, such as photos of beautiful and interesting interiors. Back in the day (5 or so years ago?) I would get so excited to find a new, cool site featuring interiors of all different styles. Now I go days without looking at photos online because if I do it too often they all start to look the same, and the novelty of the experience wore off long ago. I still get incredibly giddy when my design magazines come in the mail. It was the first thing I remembered to change my address for when I moved. The features in Veranda, House Beautiful, Elle Decor, Architectural Digest, etc., and their every 6 weeks delivery date are still special to me, and I still pick apart those rooms and analyze every detail and read every word, while photos on the Internet have become something that I scroll through at warped speeds just to try and get through it all. Back to the rocks. I think when I got bored of looking at interior photos I started to seek inspiration elsewhere. I feel that is such an important thing for a designer, so I really have the fire-hose that is the Internet to thank. I started visiting more museums and my interest in all kinds of art increased. I started traveling more and taking inspiration from the architecture, fashion, and lifestyle of each place I visit. And I've started to find inspiration in the smallest forms and look at everything with a new and more scrutinizing eye. So when I saw a giant table at the Goldenwest Swap meet yesterday, full of rocks, I had to stop. Color, shape, texture, form...these little guys had it all and I was instantly inspired. I spent a a good chunk of time curating my collection from the massive pile, and just like that...I became a rock collector. I like the idea of putting the rocks on display. They need to be seen from all sides to be fully appreciated. 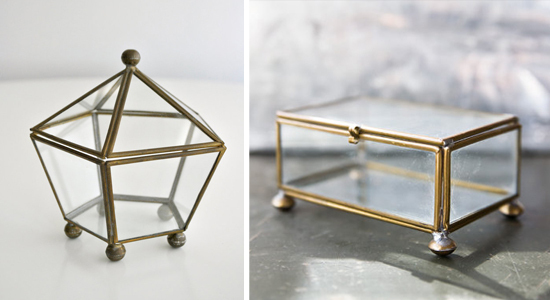 I might actually frame a few groupings, but I also want to use a brass leaded glass box to display them on my bookcase or coffee table. These vintage models are so much less expensive than modern day versions. These were in the $20 range found here and here on Etsy. I love that you are doing this. You also have given me inspiration to what I am going to do with the rocks, shells, and other little pieces of nature I have been collecting all over New Zealand when I get home with them. Your rocks are gorgeous! I can't wait to see them. Naco will be so proud!